Zoe is Oreo’s filly, born 9-16-98 on the Island of Molokai before we could move Oreo to our sanctuary. She is extremely rare. Her unusual color is due to her having “amelanosis“. She is not an albino. She has striking gold stripes and blue eyes. In horses, there is a similar condition called “Lethal White Foal Syndrome” which is associated with the occurrence of other serious birth defects. Although this color variation occasionally occurs in wild herds, the animals would likely survive only a few days at best. This is probably because zebras use their stripes as camouflage to blend in with the rest of herd. This then allows the herd, to confuse predators with the changing patterns formed by the movement of a large group. Animals that stand out from the herd are easy targets for predators. In nature, having a color variation that makes you stand out is not a good thing! There have been reports of at least two other “white” zebras in captivity. One in Germany about a hundred years ago and another at a zoo in Tokyo in the 1970’s. At this time we know of only one other zebra like Zoe alive. 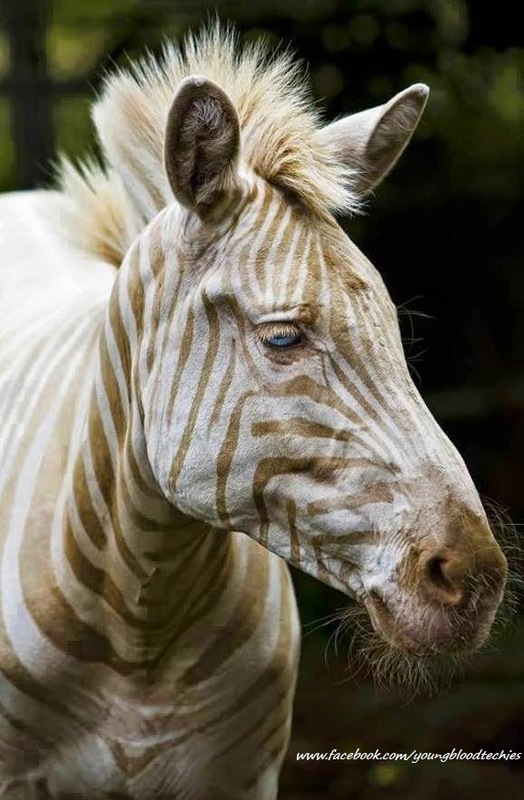 If anyone has heard of other “white” zebras, we would be very interested in hearing about them. Zoe is especially happy now that she has a little sister (Tootsie) to play with. She is very energetic and would rather run with her younger sister then graze quietly. There have been some interesting social, “herd” interactions to watch now that there is a new baby. Zoe has been accustomed to being an “only child”. After giving birth, her mother, Oreo, was very protective of the new baby and would no longer tolerate having Zoe nearby. Zoe was forced to watch from a distance, which was very stressful for her. If she came too close, her mother would chase her away, even biting or kicking at her. Zoe was very confused. Zoe now spends her nights in a separate bedroom paddock separated from Oreo and Tootsie’s by only a wire fence. Since they are herd animals, it is important that they are able to maintain visual contact with the other members of their herd in order to stay calm. After the other zebra baby was a week old Zoe was able to join them when they all are let out into the pasture for daytime grazing. Young zebra are highly social and the two babies play well together. Like a well mannered babysitter, Zoe turns and jogs away when her little sister gets too rough.